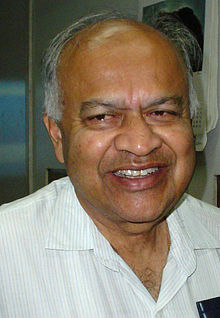 Jayant Vishnu Narlikar (born 19 July 1938) is an Indian astrophysicist. He developed with Sir Fred Hoyle the conformal gravity theory, known as Hoyle–Narlikar theory. It synthesizes Albert Einstein's theory of relativity and Mach's principle. It proposes that the inertial mass of a particle is a function of the masses of all other particles, multiplied by a coupling constant, which is a function of cosmic epoch. Narlikar was born in Kolhapur, India on 19 July 1938 in a family of scholars. His father, Vishnu Vasudev Narlikar, was a Mathematician who served as Professor and Head of Department of Mathematics at Banaras Hindu University, Varanasi, and mother, Sumati Narlikar, was a scholar of Sanskrit. His maternal uncle was the distinguished Statistician V. S. Huzurbazar. Narlikar received his BSc degree from Banaras Hindu University in 1957. He then began his studies at Cambridge University, where he received a BA (Tripos) degree in mathematics in 1959 and was Senior Wrangler. In 1960, he won the Tyson Medal for astronomy. During his doctoral studies at Cambridge, he won the Smith's Prize in 1962. After receiving his PhD degree in 1963 under the guidance of Fred Hoyle, he served as a Berry Ramsey Fellow at King's College in Cambridge and earned a Master's degree in astronomy and astrophysics in 1964. He continued to work as a Fellow at King's College until 1972. In 1966, Fred Hoyle established Institute of Theoretical Astronomy in Cambridge, and Narlikar served as the founding staff member of the institute during 1966–72. In 1972, Narlikar took up Professorship at the Tata Institute of Fundamental Research (TIFR) in Mumbai, India. At the TIFR, he was in charge of the Theoretical Astrophysics Group. In 1988, the Indian University Grants Commission set up the Inter-University Centre for Astronomy and Astrophysics (IUCAA) in Pune, and Narlikar became the Founder-Director of IUCAA. In 1981, Narlikar became a founding member of the World Cultural Council. Narlikar is known for his work in cosmology, especially in championing models alternative to the popular Big Bang model. During 1994–1997, he was the President of the Cosmology Commission of the International Astronomical Union. His research work has involved Mach's Principle, quantum cosmology, and action-at-a-distance physics. Narlikar was part of a study which cultured microorganisms from stratospheric air samples obtained at 41 km. Narlikar was appointed as the Chairperson of The Advisory Group for Textbooks in Science and Mathematics, the textbook development committee responsible for developing textbooks in Science and Mathematics, published by NCERT (National Council of Educational Research and Training). Narlikar has received several national and international awards and honorary doctorates. India's second-highest civilian honour, Padma Vibhushan, was awarded to him in 2004 for his research work. Prior to this, in 1965, he was conferred Padma Bhushan. He was awarded 'Rashtra Bhushan' in 1981 by FIE Foundation, Ichalkaranji. He received Maharashtra Bhushan Award for the year 2010. He is a recipient of Bhatnagar Award, M.P. Birla Award, and the Prix Jules Janssen of the Société astronomique de France (French Astronomical Society). He is an Associate of the Royal Astronomical Society of London, and a Fellow of the three Indian National Science Academies and the Third World Academy of Sciences. Apart from his scientific research, Narlikar has been well known as a communicator of science through his books, articles, and radio & television programs. For these efforts, he was honoured in 1996 by UNESCO with the Kalinga Prize. He was featured on Carl Sagan's TV show Cosmos: A Personal Voyage in the late 1980s. In 1989, he received the Atmaram Award by Central Hindi Directorate. He received the Indira Gandhi Award of the Indian National Science Academy in 1990. In 2014, he received a Sahitya Akademi Award for his autobiography in Marathi, Chaar Nagarantale Maze Vishwa. Besides scientific papers and books and popular science literature, Narlikar has written science fiction, novels, and short stories in English, Hindi, and Marathi. He is also the consultant for the Science and Mathematics textbooks of NCERT (National Council of Educational Research and Training, India). Narlikar married a mathematics researcher and professor, Mangala Narlikar (née Rajwade). The couple have three daughters: Geeta, a biomedical researcher at the University of California, San Francisco, Girija and Leelavati. He is the uncle of the Cambridge University social sciences academic Amrita Narlikar. ^ "Jayant Vishnu Narlikar". Biographical Memoirs of Fellows of the Indian National Science Academy. 19: 123–127. 1994. Retrieved 27 July 2015. ^ Dadhich, Naresh (10 July 2014). "Jayant Vishnu Narlikar" (PDF). Current Science. 107 (1): 113–120. Retrieved 27 July 2015. ^ "Vasant Shankar Huzurbazar" (PDF). Biographical Memoirs of Fellows of the Indian National Science Academy: 45–50. Retrieved 28 October 2016. ^ Mitton, Simon (2005). Fred Hoyle: A Life in Science. Aurum. p. 275. ISBN 978-1-85410-961-3. ^ Monte, Leslie (24 January 2015). "I don't subscribe to the bandwagon idea of Big Bang: Jayant Vishnu Narlikar". Live Mint. Retrieved 27 July 2015. ^ a b "Padma Awards" (PDF). Ministry of Home Affairs, Government of India. 2015. Archived from the original (PDF) on 15 November 2014. Retrieved 21 July 2015. ^ "Rashtra Bhushan" (PDF). Current Science. 52: 449. 20 May 1983. ^ "Narlikar honoured with Maharashtra Bhushan". The Times of India. 7 March 2011. ^ "Kalinga Prize laureate". UNESCO. Retrieved 27 July 2015. ^ "List of Awardees". Khsindia. Retrieved 26 January 2019. ^ "Jayant Vishnu Narlikar". Meghnad.iucaa.ernet.in. 19 July 1938. Retrieved 29 October 2016. ^ "Sahitya Akademi award for Narlikar". TOI. 20 December 2014. Retrieved 27 July 2015. ^ "Akademi Awards (1955–2015)". Sahitya Akademi. Archived from the original on 4 March 2016. Retrieved 2 September 2016. ^ Jayant V Narlikar. "From Black Clouds to Black Holes". World Scientific Series in Astronomy and Astrophysics (3rd ed.). 13. Retrieved 30 October 2016. Wikimedia Commons has media related to Jayant Vishnu Narlikar.